Silver ions have long been recognized for their broad-spectrum antimicrobial action. Ionic silver is effective against gram-positive and gram-negative bacteria, as well as fungi. Ionic silver hydrophilic catheter coatings can be very effective against the most common and serious UTI pathogens, including, E. coli, Candida albicians, Staph aureus, Pseudomonas, Klebsiella, MRSA, CRE and others. Silvertouch catheters incorporate the power of silver through a patented process that binds silver ions to the catheter's lubricious coating. Every Silvertouch catheter has a coating that hydrates rapidly and maintains its lubricity for at least seven days, helping to reduce friction and irritation. The coating is covalently bonded to the silicone catheter surface and will not peel, flake or crack. VERY GOOD .DID NOT HAVE UTI SINCE THEN. VERY GOOD TO AVOID UTI. I USED ALL KIND OF CATHETERS AND GOT UTI EVERY MONTH UNTIL I FOUND THE SILVER TOUCH.I CHANGE EVERY 3 WEEKS TO AVOID UTI. SO FAR ITS DOING VERY GOOD.I WILL RECOMMEND THIS PRODUCT. 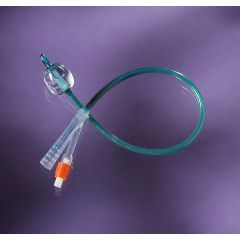 How often does this catheter need to be changed to avoid risk of infection.